The ActiveRecord query interface is an impressive feat of engineering, but often we only use a small portion of it. 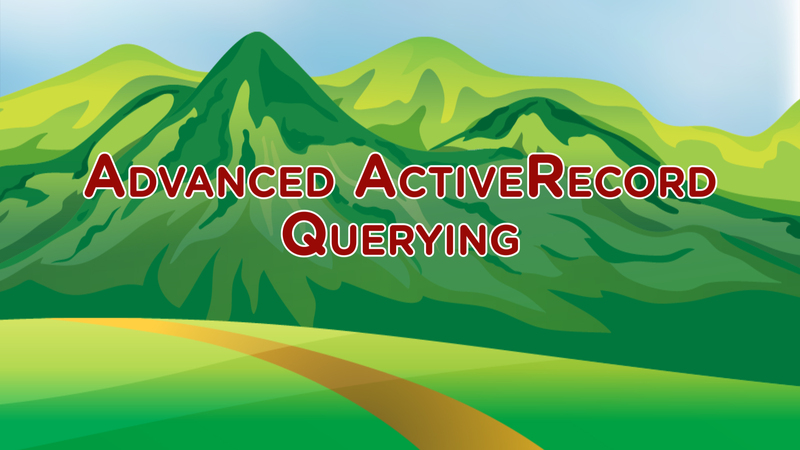 In this trail we'll dive deep into ActiveRecord and learn how to build complex queries taking advantage of eager loading, sub-selects, ordering across joins, and more! In this course, we're going to go on a deep dive into ActiveRecord and teach you everything you need to know to manage complex relationships and queries. Joe Ferris, thoughtbot CTO and querying master, will be guiding us on our journey to help us take full advantage of ActiveRecord. Learn everything you need to work with your belongs_to relationships inside the database. Use joins, merge, and more to define concise, efficient queries that take full advantage of ActiveRecord's power. Put your new querying knowledge to the test with this exercise on querying belongs_to associations. Combine joins, merge, and the rest of tactics learned in the Querying belongs_to Associations video to lock in your new knowledge. Learn advanced techniques for querying your `has_many` associations, including a deep dive into the `joins` method and how to use `merge` to compose queries and keep them logically separated. Practice makes perfect, so dive into this exercise on querying has_many associations to lock in what you learned in the previous video. Use joins, distinct selects, and subqueries to query your has_many associations with ease. In some cases ActiveRecord just can't figure out the query you need, so you'll need to write it yourself. Luckily, it's not an all or nothing proposition. In this video learn how to use custom joins to answer complex questions about your database that ActiveRecord can't do for you. ActiveRecord can do a lot, but not everything. With this exercise, practice giving ActiveRecord a hand by writing custom SQL statements to define a join, all within the context of a larger ActiveRecord query. After watching this video you'll attain querying master status. With this last installment, Joe teaches how to do some counts, minimums, maximums, averages, and sums. We'll even see how to perform these aggregations after grouping rows according to certain criteria and how to filter based on the results of these calculations, all via the database. With this final exercise we'll bring everything together and even perform calculations and aggregations in the database. Complete this and you'll truly be a querying master.